Maybe you’ve heard of “the gospel of Jesus Christ”, but have you ever heard of “the gospel of Caesar Augustus”? An ancient inscription which bears that phrase gives us understanding into what exactly the gospel of Jesus Christ is, and sheds light on the structure and content of the biblical “Gospels”, i.e. the books which tell the story of the life of Jesus of Nazareth. In English vernacular, we have terms like “gospel-truth”, which means that something is absolutely true. However, in the Bible, the word “gospel” doesn’t mean truth. When we hear this word today, our minds immediately tend to associate it with spirituality in general, or Christianity in particular, but originally, this word was political in nature. In the Greco-Roman world, from the time of Alexander the Great and on into the Roman Empire, this word was used to refer to history-making, world-shaping reports of political, military, or societal victories. I am considering running a marathon this year, and one of the things that I always keep in the back of my mind is that the person who ran the first marathon ran 42.2 kilometers (26.2 miles) to deliver a message, and upon completing this run, he DIED! The setting of that first marathon was a battle in 490 B.C. when Greece was invaded by Persia. Despite all odds, Greece managed to defeat Persia, and after the battle, Greece sent heralds to take the euangelion (proclamation of good news) out into every town and village in the country, to tell the people what had happened, and declare to them that they were free! Those heralds were “evangelists”. In the United States, when Abraham Lincoln signed the document which set the slaves in the southern states free, that news had to be taken and proclaimed in every city, town and farm in the South. Heralds were sent out who proclaimed to those slaves that something had happened, which would change their lives forever. They declared to them that because of what someone else had done, they were set free! The most divine Caesar . . . we should consider equal to the Beginning of all things . . . for when everything was falling (into disorder) and tending toward dissolution, he restored it once more and gave the whole world a new aura; Caesar . . . the common good Fortune of all . . . The beginning of life and vitality . . . All the cities unanimously adopt the birthday of the divine Caesar as the new beginning of the year . . . Whereas the Providence which has regulated our whole existence . . . has brought our life to the climax of perfection in giving to us (the emperor) Augustus . . .who being sent to us and our descendents as Savior, has put an end to war and has set all things in order; and (whereas,) having become (god) manifest /PHANEIS/, Caesar has fulfilled all the hopes of earlier times. 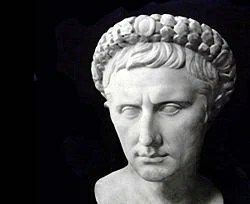 The “gospel” of Caesar Augustus was what we call today the Pax Romana, the age of peace in the Roman Empire which came about during this time, into which Jesus was born. Caesar Augustus in this inscription is declared to be: divine, savior, and the beginning of the good news for all people on Earth. When we understand this term “gospel” (euangelion), and how it was used in the ancient Greco-Roman world, we can begin to better understand the specific way in which the Christian gospels of Jesus Christ were written. They were written in such a way as to present Jesus as the true divine King, who had come to bring true salvation to the whole world, and they were written as a direct challenge to the so-called “gospel” of Rome and its peace which was enforced through brutality, and which did not provide any actual salvation. The gospel is a message of a victory which has taken place, from which we benefit. We receive salvation, freedom and peace as a result of it. The gospel, therefore, is good news, not good advice! It’s not about what you have to do for God, but it’s the news of what God has done for you in Christ to set you free. The Last Supper? Actually, No. This week is Holy Week, the week during which we remember the final week of Jesus’ life on Earth leading up to his crucifixion and resurrection. However, there are several aspects to these traditions that might be misleading. First of all, Jesus’ Passover Dinner with his disciples would have been on Wednesday evening. According to Jewish thinking, this would have been Thursday, since in Jewish thinking the new day begins at sundown. Thus, what we consider to be Wednesday night would actually be considered Thursday by the Hebrews. In other words, the meal commonly referred to as “the last supper” was not ever meant to be thought of as the last supper that Jesus would have with his disciples, but as the preview of the great supper that they would one day share with Jesus in His Kingdom. In other words, Communion, AKA the Lord’s Supper, AKA the Eucharist is an eschatological supper, through which we remind ourselves week in and week out of what is to come: the wedding feast of the lamb, in the New Jerusalem (Heaven). As you remember and reflect during Holy Week on Jesus’ penultimate supper, and every time you take communion, keep in mind that we do so both as an act of looking back and as an act of looking forward! Both are essential aspects of the hope that we have in Jesus! For the season of Advent, I’m going to try to share several devotional thoughts over the course of the next few weeks. The word Advent comes from the Latin: Adventus Dominum – “the coming of God”. It is a time when we focus on how God came into our world in the person of Jesus Christ. My favorite place to begin in the story of Jesus is the first chapter of the Gospel of John. John’s Gospel is different than the others in that John begins his account of Jesus BEFORE Christmas – in eternity past. However, where John is similar to the other Gospel writers is that before he talks about Jesus, he talks about John the Baptist (or “J the B” as I like to call him). Why is John the Baptist an important part of the Advent story? Because the first important thing to know about Christmas is that Advent is an indictment before it is a joy. The very fact that God had to come into this world to save us, shows what dire straights we are in. J the B came to prepare the hearts of the people for the coming of the Savior. And how did he do it? By calling people to confess their utter sinfulness, and acknowledge their desperate need for a salvation which they were unable to attain for themselves. We cannot fully appreciate the joy of Christmas until we first come to terms with WHY Jesus had to come: because we all desperately need a Savior and our plight is so serious that none other than God Himself would be capable of meeting that need. The hard fact is that Advent is an indictment: that your condition is so dire that GOD had to die for you, in order to save you. The Good News of Advent is that God was glad to die for you, in order to save you.